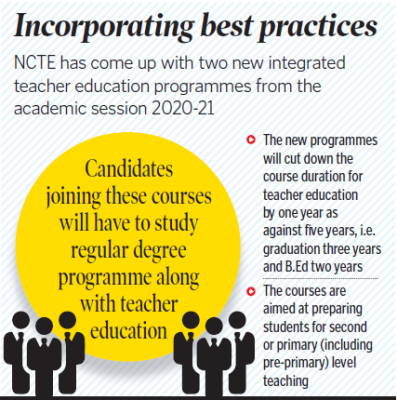 Hyderabad: The National Council for Teacher Education (NCTE) has sought consent of the State government for introducing two new four-year integrated teacher education programmes in the universities and degree colleges. 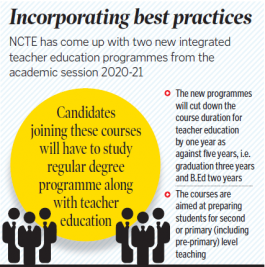 In order to improve teacher education across the country, the NCTE has come up with two new integrated teacher education programmes from the academic session 2020-21. The new courses are aimed at preparing school teachers through intensive four year integrated courses involving teacher education and regular courses including science and humanities streams. This means, candidates joining these courses will have to study regular degree programme along with teacher education. Presently, a two-year BEd programmes were being offered in the colleges and students who complete their graduation course can opt for it. The new programmes would cut down the course duration for teacher education by one year as against five years i.e. graduation three years and BEd for two years. The NCTE in a letter to the State government said that new programmes prescribe model curricular which incorporate best practices from India and also around the world that will certainly bring about a paradigm shift in the way teacher education programmes are conducted in the country. The requirement of infrastructure and teaching faculty have been consciously kept at levels which world make it available for existing universities and degree colleges to easily adopt either of these programme with minimum strain on existing resources, the NCTE said. The courses are aimed at preparing student for second or primary (including pre-primary) level teaching. “The NCTE has always considered the States as the most important stakeholder to achieve planned and coordinated development of teacher education across the country. Accordingly, it would be imperative that you kindly indicate your consent for these two new programmes so that we can consider inviting applications from your State,” said the NCTE in a letter to the State government. The Telangana State Council of Higher Education authorities felt that new programmes could be started in the government colleges on pilot project basis. “If there are seekers for the two programmes, it can be introduced in other colleges,” authorities said.